This genuine antique engraving/print is titled "SOCIAL STUDIES BEHIND THE SCENES AT BUFFALO BILL'S", by FREDERIC REMINGTON, published in "Harper's Weekly" August 1894. globally to museums, Institutions, art dealers, researchers, genealogists, movie sets, interior designers, authors, knowledgeable collectors and beginners too. Find the subject matter you are looking for. FREE scheduling, supersized images. Also included on this page is information about my services and old newspapers and antique wood-block engravings. Simply go to my. Are you wondering, or are uncertain, what engravings are?. Authentic antique print by Frederic Remington titled, LIEUTENANT S.C. ROBERTSON, CHIEF OF THE CROW SCOUTS. Published in "Harper's Weekly" Dec. 27, 1890. Will be matted making that size about 13 x 12. DecorArts A Dash for the Timber Frederic Remington Classic Art Reproductions. Authenticantique by Frederic Remington titled, MINERS WITH THEIR SUPPLIES CROSSING LAKE LINDEMANN, HEAD OF THE YUKON RIVER. Lake Lindemann is on the Chilkoot Trail in British Columbia. Published in "Harper's Weekly" 1896. This genuine antique engraving/print is titled "BATTERY K AT DRILL IN THE BERKSHIRE HILLS, MASSACHUSETTS", by FREDERIC REMINGTON, published in "Harper's Weekly" August 1895. FREE scheduling, supersized images. Find the subject matter you are looking for. Also included on this page is information about my services and old newspapers and antique wood-block engravings. Simply go to my. Are you wondering, or are uncertain, what engravings are?. This genuine antique engraving is titled "IN THE CAVE OF THE DEAD", by Frederic Remington, published in "Harper's Weekly" January 1890. globally to museums, Institutions, art dealers, researchers, genealogists, movie sets, interior designers, authors, knowledgeable collectors and beginners too. This genuine antique engraving/print is titled "I BEGAN THE RETREAT AS I INTENDED", by FREDERIC REMINGTON, published in "Harper's Weekly" May 1895. Find the subject matter you are looking for. Also included on this page is information about my services and old newspapers and antique wood-block engravings. This genuine antique engraving is titled "CAVALRY--EXTENDING-ORDER DRILL", by FREDERIC REMINGTON, published in "Harper's Weekly" September 1894. excellent condition, highly displayable and. My goal is. Globally to museums, Institutions, art dealers, researchers, genealogists, movie sets, interior designers, authors, knowledgeable collectors and beginners too. FREE scheduling, supersized images. Also included on this page is information about my services and old newspapers and antique wood-block engravings. This genuine antique engraving is titled "BURNING THE RANGE", by FREDERIC REMINGTON, published in "Harper's Weekly" September 1887. Find the subject matter you are looking for. My goal is. globally to museums, Institutions, art dealers, researchers, genealogists, movie sets, interior designers, curators, authors, knowledgeable collectors and beginners too. Beautiful hand-colored original wood engraving featured in Harper's Weekly. September, 1886. FREDERIC REMINGTON SHEEP RANCHING. This genuine antique engraving is titled "SHEEP RANCHING", published in "Done in the Open" by Frederic Remington 1902. excellent condition, highly displayable and. globally to Museums, Institutions, Archivists, Historians, Educators, Art Dealers, Researchers, Genealogists, Movie Sets, Interior Designers, Curators, Authors, Knowledgeable Collectors and beginners too. This genuine antique engraving is titled "THE TRAINING OF CAVALRY--A ROMAN RACE AT THE RIDING HALL, FORT MYER, VIRGINIA", by FREDERIC REMINGTON, published in "Harper's Weekly" April 1898. This engraving from the year of 1898 is a. This genuine antique engraving/print is titled "A FIGHT IN THE CANON", by Frederic Remington, published in "Harper's Weekly" January 1890. Find the subject matter you are looking for. Also included on this page is information about my services and old newspapers and antique wood-block engravings. This genuine antique engraving is titled "HUNTING THE CARIBOU--SHOOT!, by FREDERIC REMINGTON, published in "Harper's Weekly" January 1890. This dated engraving from the year of 1891 is a BIG 15 x 21" in size with wide margins. This genuine antique engraving/print is titled "TROUT-FISHING THROUGH THE ICE IN THE CANADIAN WILDERNESS", by FREDERIC REMINGTON, published in "Harper's Weekly" March 1890. Also included on this page is information about my services and old newspapers and antique wood-block engravings. This genuine antique engraving is titled "THRUST HIS LANCE THROUGH HIS BODY AND RODE HIM DOWN", by Frederic Remington published in "Harper's Weekly" December 1889. My goal is. FREE scheduling, supersized images. I do not deal in copies/reproductions. globally to Museums, Institutions, Archivists, Historians, Educators, Art Dealers, Researchers, Genealogists, Movie Sets, Interior Designers, Curators, Authors, Knowledgeable Collectors and beginners too. FREDERIC REMINGTON ENGLISH MILITARY, HIGHLANDER KILTS. FREE scheduling, supersized images. Also included on this page is information about my services and old newspapers and antique wood-block engravings. This genuine antique engraving/print is titled "AN OX TRAIN IN THE MOUNTAINS", by FREDERIC REMINGTON, published in "Harper's Weekly" May 1888. My goal is. globally to museums, Institutions, art dealers, researchers, genealogists, movie sets, interior designers, authors, knowledgeable collectors and beginners too. Authentic antique print by Frederic Remington titled, FIGHTING OVER THE CAPTURED HERD. Published in "Personal Recollections of Gen. Miles" 1896. This print is in excellent condition except for one margin tear with archival repair on verso. My goal is. globally to museums, Institutions, art dealers, researchers, genealogists, movie sets, interior designers, authors, knowledgeable collectors and beginners too. Find the subject matter you are looking for. This genuine antique engraving is titled "THE ORDEAL IN THE SUN DANCE AMONG THE BLACKFEET", by Frederic Remington published in "Harper's Weekly" December 1890. My goal is. globally to museums, Institutions, art dealers, researchers, genealogists, movie sets, interior designers, curators, authors, knowledgeable collectors and beginners too. This genuine antique engraving is titled "CROW INDIANS FIRING INTO THE AGENCY", by FREDERIC REMINGTON, published in "Harper's Weekly" November 1887. globally to museums, Institutions, art dealers, researchers, genealogists, movie sets, interior designers, curators, authors, knowledgeable collectors and beginners too. This genuine antique engraving/print is titled "SKETCHES ON A MAN-OF-WAR UNDER SAILING ORDERS--THE LAST ON BOARD", by FREDERIC REMINGTON, published in "Harper's Weekly" February 1887. Simply go to my. This genuine antique engraving is titled "A CUBAN TOBACCO-PLANTER IN HIS VOLANTE", by FREDERIC REMINGTON, published in "Harper's Weekly" March 1892. globally to museums, Institutions, art dealers, researchers, genealogists, movie sets, interior designers, authors, knowledgeable collectors and beginners too. This is a original engraving from Harper's Weekly, March 2, 1889. Horse raising in the Northwest by Frederic Remington. 16" x 11". Ready for framing. This genuine antique engraving is titled "HURDLING ON THREE HORSES", by FREDERIC REMINGTON, published in "Harper's Weekly" April 1898. I do not deal in copies/reproductions, everything is original from the year described. Published in "Harper's Weekly" 1896. This print is in excellent condition and isNOT A REPRODUCTION OR REPRINT. This genuine antique engraving is titled "THE WATER JUMP AT CEDARHURST", by FREDERIC REMINGTON, published in "Harper's Weekly" September 1888. Find the subject matter you are looking for. I have provided. This fine Remington was published in "Harper's Weekly" June 1, 1889. It is a dated sheet. This is NOT a reproduction. 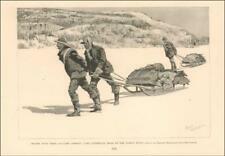 Antique print by Frederic Remington of men fishing from canoes in Canada published in 1896. Published in "Harper's Weekly" Jan. 24, 1891. This print is in excellent condition and isNOT A REPRODUCTION OR REPRINT. Globally to museums, Institutions, art dealers, researchers, genealogists, movie sets, interior designers, authors, knowledgeable collectors and beginners too. My goal is. Find the subject matter you are looking for.